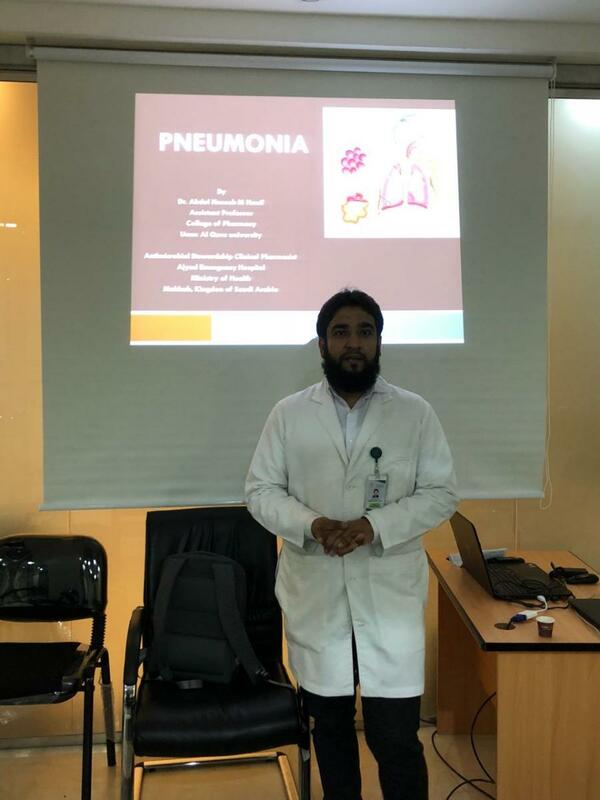 Community Service Unit organized an awareness lecture on pneumonia at the emergency unit of Ajyad Hospital in Makkah on Wednesday, 21/3/2018. The lecture was delivered by Dr. Abdel-Hassib Mohammed Hanif, Associate Professor at the Department of Clinical Pharmacy, College of Pharmacy. The lecture is designed to raise awareness on the most common disease “pneumonia”, which accounts for 15% of all deaths, especially among children under 5 years old. It is a form of acute respiratory infection that affects lungs. Dr. Abdel-Hassib explained the main causes of pneumonia, which are due to several infectious factors; including viruses, bacteria and fungi. He explained that pneumonia can spread in many ways through the transmission of viruses and bacteria that are usually found in mouth or throat to the lungs. It also can be transmitted by the droplets caused by coughing or sneezing; in addition to the transmission through blood. Dr. Abdel-Hassib pointed out the importance of prevention and treatment of pneumonia caused by bacteria with oral antibiotics, and by providing the appropriate nutrition as well as addressing environmental factors; such as air pollution and promoting adherence to hygiene principles. This lecture was organized as part of a series of awareness lectures provided by the Community Service Unit of the College of Pharmacy to raise awareness of the community against the spread of such diseases and to improve the medical and health services in the community.